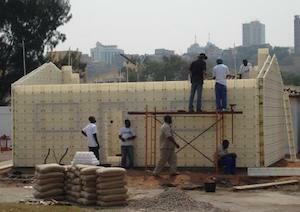 The Moladi building system uses a removable, reusable, lightweight and recyclable plastic formwork mold. This mold is filled with an aerated mortar that is approved by the South African Bureau of Standards to form the wall of the house in as little as one day. Each mold can produce about one house per-day, with labor supplied by approximately 16 unskilled workers. Each mold can be used 50 times and then recycled to make toilets, sinks, etc. The process involves a number of smaller components. These components are assembled into larger, lightweight panels, which are configured into a mold which forms a house of any desired size and design. The panels are then removed the next morning and immediately re-erected onto an adjoining site. The result is a wall with an off-shutter finish that requires no plastering, beam filling or chasing, and produces no waste. Moladi has simplified its construction technology so it can be used by unemployed and unskilled workers. Using the formwork, one square meter of wall can be produced for approximately $7 USD. The multi-award winning Moladi construction system was founded in 1986 in South Africa as a method of building cast structures, rather than reinforced monolithic structures. The Moladi technology was created as a means to alleviate many of the cumbersome and costly aspects associated with conventional construction methods.